How Do I Weigh the Risks and Benefits of Taking an Antidepressant Medication During Pregnancy? Mary is a 29 year old woman who is 8 weeks pregnant with her third baby. At her first prenatal visit with her health provider she states that she wasn’t planning this pregnancy and is overwhelmed. She has daily crying spells, is having trouble sleeping, and is forcing herself to eat once a day because she knows she “has to.” She says that she just lies in bed unless she has to go to work, and she struggles to take care of her two children. She denies thoughts that she might harm herself or others. Mary was diagnosed with major depressive disorder three years ago and was previously controlled on citalopram, a common serotonin reuptake inhibitor (SSRI) medication. However, her psychiatrist discontinued it a month ago because of concerns that wasn’t safe to use any of these medications during pregnancy. Mary states that she is confused and miserable, and doesn’t know what to do. How do you answer Mary’s questions and assist her in making an informed decision? According to the CDC, 1 out of 10 women, 18-44 years old, reported symptoms of depression in 2016. Information about antidepressants is the second most common reason for a call to Teratogen Information Services (analgesics are first). Ailes et al reported that in 2013, 6.2% of pregnant women used an antidepressant. Of those women who took an antidepressant, 77% were prescribed an SSRI. A decision about whether to treat a pregnant woman with any medication involves taking into account factors that include the severity of the condition, the consequences for the mother and fetus from the untreated maternal condition, consideration of non-medication strategies, and evaluation of the available data on risks to the fetus from various choices of medication. Because depression itself presents risk to the pregnancy and fetus, it is difficult to determine whether the medications, maternal condition, or both are causing adverse effects. This difficulty is called “confounding by indication”. However, some studies have tried to determine the contribution of each risk factor. What are the risks to mother and her baby from untreated depression? It is self-evident that significant depression is painful for the woman, and may interfere with diet and sleep, impair relationships with her partner and her other children, and even result in self harm such as suicide. In some cases, a woman with untreated depression will resort to unhealthy solutions including use of tobacco, alcohol, or illicit drugs. In addition, studies have documented risks to the fetus and pregnancy from untreated or poorly treated maternal depression. These adverse effects include miscarriage, preeclampsia, preterm delivery, and low birthweight. These factors provide significant impetus to treat moderate-severe maternal depression with antidepressants or other medications. Are non-medication strategies a possibility? Given our inability to prove absolute safety of antidepressant medications, women with mild depression may consult with their health care provider and decide to undertake a trial off of medication. There is evidence that non-medication strategies can be effective in treating mild depression and may be sufficient. These strategies include counseling, exercise, and meditation. A recent article on light therapy found that it was as effective as fluoxetine (an SSRI medication) in treating non-seasonal major depressive disorder. Current evidence suggests that these alternative therapies are unlikely to have any adverse effects on the fetus. What are the risks to the baby from maternal use of a SSRI antidepressant? Malformations – a small increase in a variety of birth defects has been seen in studies regarding the SSRI’s. However, the findings are not consistent across studies. An increase in congenital heart defects was found in some but not all of the studies involving paroxetine, and the prevalence was only slightly greater than the background risk for this common group of birth defects. Obstetrical complications – some studies have found an increased incidence of low birth weight and early delivery when the mother is taking an SSRI. Issues with newborn adaptation – persistent pulmonary hypertension (a rare but potentially serious complication, risk of 0.1-0.2%), and neonatal abstinence syndrome/poor neonatal adaption syndrome (risk ~30%) are well described complications associated with maternal SSRI use. Neonatal abstinence syndrome can include a high pitched cry, tremor, sleep disturbances, and gastrointestinal distress. These symptoms resolve within a few weeks after delivery, often without intervention, although some babies need special care. Other exposures near term including maternal smoking, opioids, and other psychiatric medications can worsen the symptoms. Cognitive and behavioral manifestations – similar to other findings, a variety of positive and negative effects have been observed. Some studies have demonstrated early childhood social-emotional disorders including autism, attention deficit hyperactivity disorder, and childhood depression/anxiety. These disorders appear to be increased in offspring of depressed women, regardless of whether they take an SSRI antidepressant. Further research is needed to evaluate the long-term risks of in-utero SSRI use on the neurodevelopment of the child. Why are the data inconsistent? Are we able to determine causality? Design factors influence the variability of results observed from clinical trials evaluating the safety of antidepressants in pregnancy. These include data collection (prospective vs. retrospective), design (randomized, controlled vs. cohort vs case-control), and the number of patients included (are there sufficient patients to detect a difference between groups). Patient-specific factors that may impact the results include adherence (did the exposed group actually take the drug), picking the appropriate control group (healthy patients vs. patients with depression not taking medications), timing of the exposure (most malformations are an issue in the 1st trimester, whereas growth and neurobehavioral development are often 2nd and 3rd trimester concerns), adjustment of the data based on degree of maternal depression (well controlled depression has less risk than severe uncontrolled depression), and accounting for other confounders (other medications, other diseases, and recreational exposures like cigarette smoke). Can we extrapolate general information on SSRI’s to specific agents? Although SSRIs have the same mechanism of action and similar characteristics, each medication has a slightly different chemical structure and properties that may influence risk. Although some studies have tried to evaluate the risk with individual agents, these studies have had variable numbers of exposures for the individual agents that are often small, and inconsistent results have occurred amongst the publications. 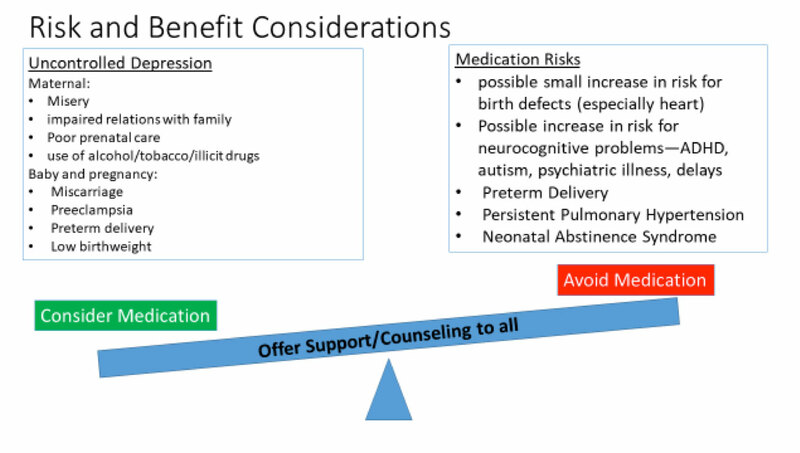 Risk Counseling: Why is it so hard to evaluate data and then effectively inform a pregnant woman about using medication to treat depression? The data are inconsistent, there are many confounding factors, and for many of the concerns the possible increase in risk is very small. It is important to remember that in order to establish causation a similar pattern should be seen across studies, and the incidence of an adverse outcome should be greater than the background risk. The SSRI’s are a good example of how difficult it is to determine whether the adverse outcomes are actually being caused by the medication exposure or are associated with the maternal condition or other confounders. The decision making process about whether to use an antidepressant during pregnancy is complex: no option is risk free, and each woman is unique. It is essential to take into account both the risks and benefits in assisting the patient in making a personal decision that is right for her and her baby. Counseling a woman and her partner about the risks of using an antidepressant medication is made more difficult by the fact that the woman’s anxiety may be painfully increased by the information, resulting in difficulty making a decision. It is also difficult to convey risk effectively when the chances are low but not zero. There are a great deal of data on the risks of many of the antidepressant medications, but it is still not sufficient to ‘guarantee safety’. Sometimes it takes decades for adverse effects to become evident. With the SSRIs there are still a number of unknowns, particularly in terms of neurobehavioral effects, and there may be issues that we are not even considering currently. Therefore, while overall information is relatively reassuring, studies do not all agree, and the lack of a black and white choice can be very distressing for patients. Ailes EC, Simeone RM, Dawson AL et al. Using insurance claims data to identify and estimate critical periods to antidepressants. Birth Defects Res A Clin Mol Teratol 2016;106:927-34. Alwan S, Friedman JM, Chambers C. Safety of serotonin reuptake inhibitors in pregnancy: A review of the current evidence. CNS Drugs 2016; 30:499-515. Angelotta C, Wisner KL. Treating depression during pregnancy: Are we asking the right questions? Birth Defects Research 2017; 109:879-887. Lam RW et al. Efficacy of bright light treatment, fluoxetine, and the combination in patients with nonseasonal major depressive disorder: A randomized clinical trial. JAMA Psychiatry 2016; 73(1)56-63. Liu X, et al. Antidepressant use during pregnancy and psychiatric disorders in offspring: Danish nationwide register based cohort study. BMJ 2017; 358:j3668 http://dx.doi.org/10.1136/bmj.j3668. Ornoy, A. Neurobehavioral risks of SSRI’s in pregnancy: Comparing human and animal data. Reproductive Toxicology 2017; http://dx.doi.org/10.1016/j.reprotox.2017.05.003.